Engagement? Check. Bridal shower? Check. Bachelorette party? Check. Rehearsal Dinner? Done. Wedding day? Best day ever! Honeymoon? Relaxing and romantic! Now you and your new husband are ready to start your life together, right? Well, not just yet. There is one more important task that must be done before you can forget everything and fall into newly-wedded bliss: Thank You cards. When preparing to send thank you’s, pretend you are Oprah and it is the twelve days of Christmas, EVERYBODY gets a thank you! This includes anyone who had a part in making your wedding the best day ever. Your friends and family who attended the wedding, whether they gave you a gift or not. Anyone who sent you a gift who may not have been able to make it to the wedding. Your wedding party, officiant, flower girl and ring bearer. Your vendors, photographer, wedding planner, hair dresser, and makeup artist. You may have paid that last group but they still deserve recognition for the role they played in your special day. It is common knowledge that people have up to a year to send a wedding gift, so that must mean you have a year to send thank you cards, right? Not quite. According to the Emily Post Institute, one of K Couture’s go to’s for etiquette, thank you’s should be sent within three months of receiving a gift. If you are able to send thank you cards out even quicker, the recipients will be pleasantly surprised and appreciate it that much more. It shows that you really loved your gift and couldn’t wait to express your gratitude. Now, it does take some organization to get thank you cards written and sent that quickly. The day you receive that first gift in the mail is so exciting. You wait with anticipation until you and your fiancé can open the gift together. Will it be a toaster? That beautiful vase you could never buy for yourself? Or maybe it’s those funky salt and pepper shakers you just had to register for! You tear open the box, rip through the packing and STOP! Rewind, find the card and immediately write down who gave you your first official wedding gift. Ok, now you may proceed with frantically opening the gift. After all it is the first one! As you continue to receive more gifts, there are a few ways to keep everything organized. You can track each gift and who gave it on a spreadsheet. This comes in handy for tracking which thank you cards you’ve written and sent as well. Or you can store all the cards in a folder or binder. Write what was given on each card. This way, you can read the sentiments sent with the gift right before you write the thank you. Another option is to check your wedding website which may have a way to track gift givers through the registry section. Choose the method that works best for you and note who has given each gift as soon as you receive it. Once you have your organization system down, it’s time for the fun part, choosing your cards! The thank you card should carry a similar theme as the rest of your wedding. If you had a black-tie wedding, choose monogrammed stationary embossed with gold or silver. If your wedding was one giant party, use a goofy but cute photo of you and your boo from the reception. When buying cards, make sure to always buy extras. Making mistakes is inevitable. Whether it’s spilling a drink on a card, writing the wrong address or misspelling a name, you are bound to need at least a couple of extra cards and envelopes. When buying cards, it is preferable to purchase from a store, but if you have to purchase online, always read the reviews. Of course, there is always one person who will complain about something insignificant like the box being packed with peanuts instead of bubble wrap. Generally though, the reviews are helpful when it comes to the quality of the cards such as the thickness of the paper or if the envelopes don’t seal well. Another pro tip, invest in a return address stamper personalized with your name and address. This is a huge time saver and can be found on Etsy for less than $10, well worth the cost! Once you have the thank you cards chosen it is time for the not as fun part, writing the thank you cards. This may seem like a daunting task but there are a few ways you can make it easier. Start writing the thank you note each time you receive a gift. People will start sending gifts as soon as you announce your registry information. If you write cards as gifts come in, there will be a lot less to write after the wedding. Or, write a few each day to break up the task. Make sure to keep track of which cards you and your husband have written so you don’t forget anyone or accidentally send the same thank you twice. Another option is to make a date day or night for writing thank you’s. Grab some snacks, throw on some good music and write away. The more fun the atmosphere, the quicker the task goes. When writing so many thank you cards, it can get very monotonous and tedious but it is important to make each card personal. Thank each person for the specific gift they gave you. If you receive money as a gift, there are more polite ways to say thank you than “thanks for the cash.” Instead, you can say “thank you for contributing to our honeymoon fund” or “thank you for your generous gift. We plan on buying a home soon and your support is a great help.” Phrasing it like this is a little more respectful. Another way to personalize each note is to mention something specifically from the wedding, such as, “Thank you for celebrating with us. It was so fun dancing to ‘Celebration’ with you.” Or, acknowledge how that person has influenced your relationship. For example, if you are writing to your aunt who was the first to meet your new husband, tell her how she made him feel like a part of the family from the beginning. People will love to hear your appreciation, especially if they didn’t realize the impact they’ve had on your relationship. Thank you cards are so important, especially in the modern world full of technology. 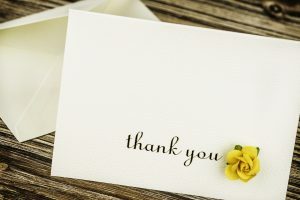 Handwritten notes are a dying art form so your family and friends will appreciate it if they can see the extra time you put into writing a personal note of your appreciation and thanks.